Window screens are made out of lightweight material like aluminum, and covered with a mesh screen, usually made out of nylon or lightweight metal. Because these screens are so lightweight, they can bend, resulting in an ill-fitting screen that can no longer do its job. Fixing bent window screens isn't difficult and can be done quickly. You'll rest easier knowing that critters are now safely on the other side. 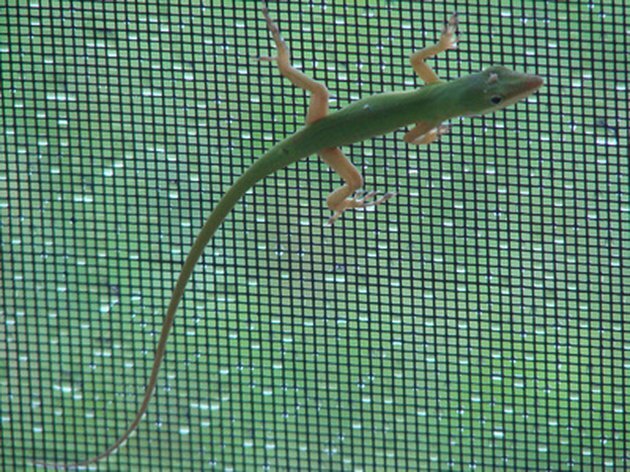 Use window screens to keep the critters out. Remove the bent screen from the window. Use the screen tabs to pull up and out on the screen frame. Place the bent screen on a flat surface. Locate the end of the window spline in the spline channel. Pull this out with a flathead screwdriver. Remove the spline from the channel all around the frame, and then pull out the screen. Determine which side of the screen is bent. Use its unbent partner to measure the proper length. For example, if a screen is bent on the right side, measure the left side to find the original frame length. If both sides are bent, measure the window opening. Cut the aluminum frame piece to size with the hacksaw. If you're cutting a new piece from a measurement, make the cut 1/4 inch shorter than measured. Pull the screen apart by the corners. Replace the bent pieces with the new cut pieces. Replace the screen. You can replace the old screen, but it's probably easier to put in a new one or change it out if it was torn when the window screen was bent. Lay the screen material over the screen frame. Cut it roughly to size. Start at one corner of the screen. Press the edge of the screen into the channel with the plastic spline piece. Roll over the spline with the spline roller to secure it in the channel. Continue the process in Step 7 until you have worked your way around the entire screen. Trim any excess material with a sharp utility knife.